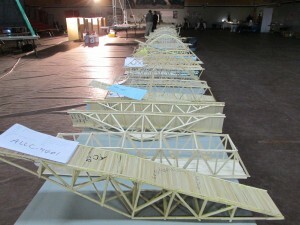 Recently, I had the pleasure of being a committee member for the annual bridge building contest hosted by Science Adventures Yukon and the Association of Professional Engineers of Yukon. Each year, students from schools throughout the Yukon (mostly Whitehorse) build bridges out of wooden coffee stir sticks, glue and dental floss and put them to a loading test. This year, we had about 100 beautiful bridges competing. My job (among others) was simple: keep adding weights to them until they break.